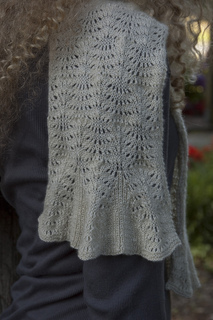 This lovely fairy-light lace scarf is knit in two directions, beginning in the middle, with the Ostrich Plumes lace pattern. 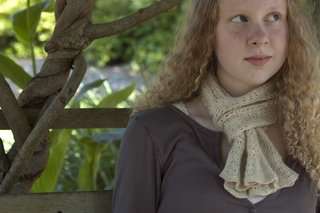 At each end two ribbed gores are worked into the lace pattern to form a delightful flounce. The two sections may either be joined with kitchener to produce an interrupted flow of the lace pattern or the stitches for the second half may be picked up from the first half stitches waiting on scrap yarn as a provisional CO to produce the same result. We recommend using Ravenwood Cashmere for this project-- of the finest quality, grown in the state of Washington, and always naturally processed.